The next generation of Air Force officers has just begun one of the toughest challenges of their lives. About 1,200 basic cadets — the Air Force Academy’s class of 2018 — arrived on June 26 for inprocessing, and the first phase of basic training. 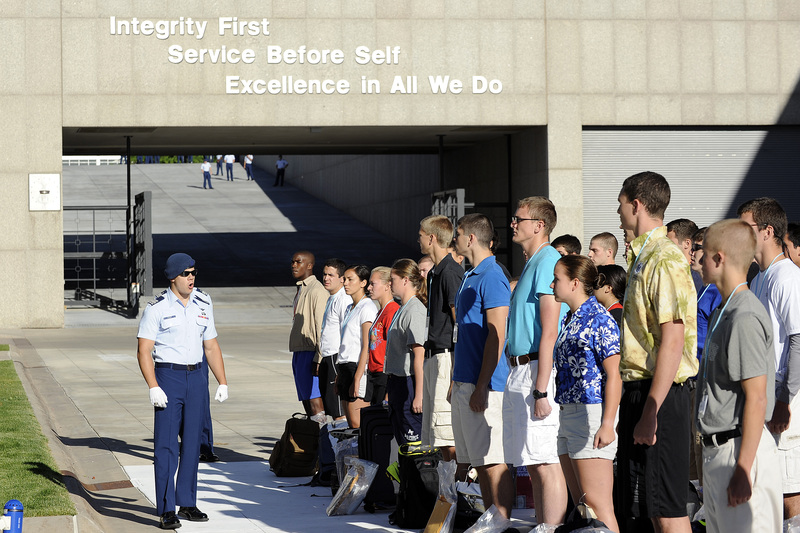 Basic training includes marching drills, inspections, weapons training, learning about the Uniform Code of Military Justice, first aid, honor and ethics lessons, and an introduction to the Air Force’s core values. Training also includes strenuous physical conditioning, such as Basic Cadet Cody Robinson’s first pushups in basic training, seen at right, under the close eye of cadet trainers. On July 21, the class of 2018 will march out to Jacks Valley for the so-called “Second Beast” phase of basic training. During Second Beast, basic cadets will live in a tent city and go through obstacle courses, assault courses, field medical training, problem-solving leadership reaction courses, and other training activities. I’ll be flying out to the Academy with photographer Mike Morones later this month, to spend a few days embedded with the basic cadets as they go through Second Beast. I’m looking forward to meeting these young men and women, finding out what has led them to choose a life as an Air Force officer, and seeing how the training transforms them. The class of 2018 includes 14 international cadets from Bulgaria, Gabon, Kazakhstan, Malaysia, Moldova, Pakistan, Romania, South Korea, Sri Lanka, Taiwan, Thailand, and the United Arab Emirates. Basic training ends Aug. 2. On Aug. 5, they will earn their first military rank at the acceptance parade, after swearing the Air Force honor oath. They will begin classes at the academy on Aug. 13.